The picture above is of what I think of as The Ultimate sandwich. 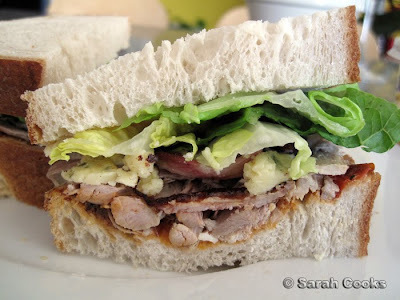 Thickly sliced white bread, chilli jam, turkey, crisply fried bacon, crumbled Stilton, and cos lettuce. 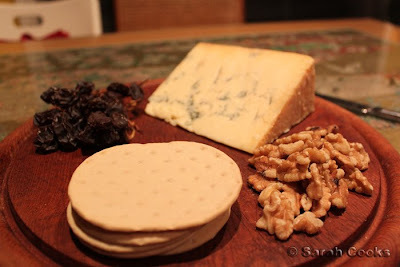 Ok, so this one's not quite leftovers, because I bought the Stilton specifically to make it. And I ate it whilst I was preparing our Christmas Eve meal. 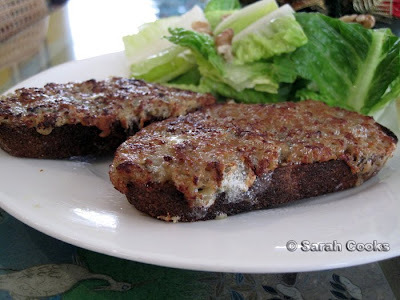 The recipe comes from Nigella's Feast, and is kinda like toast topped with a cheesy sauce, served with a salad made of little gem lettuce, walnuts, walnut oil and lemon juice. 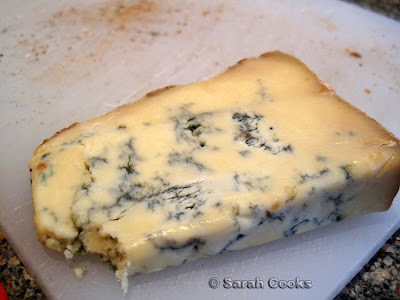 The cheese in question was a gorgeously sharp Colston Bassett Stilton that I got from Leo's in Kew. Check out all the pretty blue lines! As I mentioned, I only made a half-quantity of chestnut stuffing, leaving me with half a tin of chestnut puree and half a tin of chestnuts. 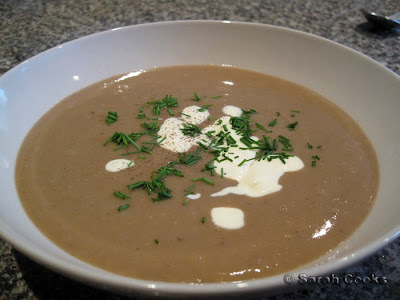 They got turned into a velvety lentil and chestnut soup from Nigella's How to Eat (previously made here), which I served with leftover cream and some chives. The recipe actually made quite a bit of soup, so I've frozen some for future work lunches. 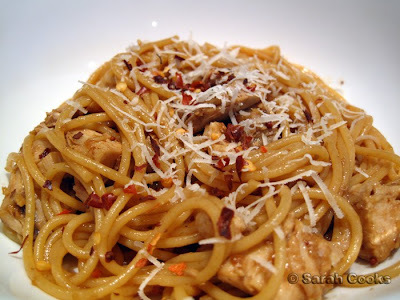 Inspired by How to Eat's pasta with butter and stock-cube juices, I cooked some spaghetti, and added some jellified turkey gravy and turkey meat. And now we get to the things that are less like recipes and more like "ooh, look what I found in the fridge!". This was leftover roast potatoes, sliced and heated through in a pan, (i.e. fried! ), eaten with leftover gravy. You know it makes sense. A good way to use up leftover dumplings (i.e. 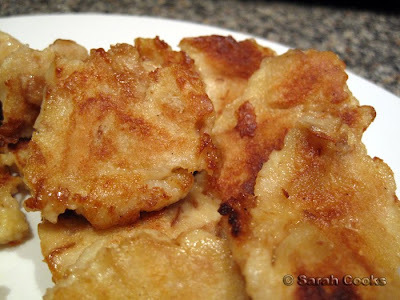 German doughy dumplings), is to slice them and fry them. I actually think I like them better this way! These were with scrambled eggs, although if I were making this for myself, I'd probably just eat the dumplings with gravy, haha. Ok, so definitely not leftovers, but a post-Christmas treat for my brother and I (the only blue-cheese eaters in my house!) I had gone back to Leo's on the morning of Christmas Eve to get last minute supplies, and decided that I needed more Stilton. Unfortunately, they'd run out of Colston Bassett, so I got a good wedge of Quenby Hall, which I discovered is a bit creamier and milder than the Colston Bassett. 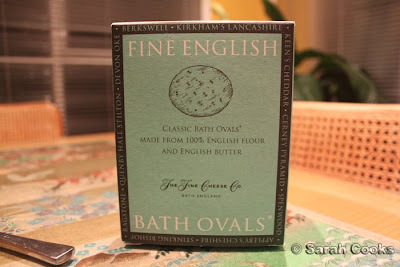 We ate them with walnuts, muscatels, and these delicious English Bath Ovals (which are specially made to match the Quenby Hall Stilton!) And a glass of port. What a wonderful Christmas treat! 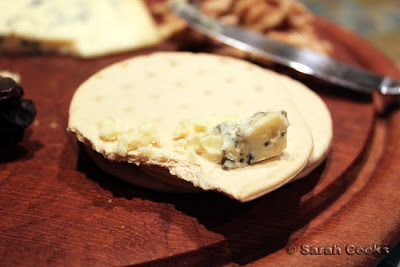 I am so keen to do what this enterprising blogger did, and soak a whole head of Stilton in port, but the smallest ones you can buy are 2 KILOS, which is too much cheese, even for me. (And at approx $75/kg, it's way too extravagant). Maybe one day. Merry Christmas everybody!! I hope you all had a wonderful day, with lots of food, family and fun! (And also some sweet sweet presents). 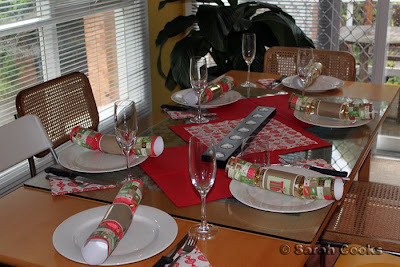 We had our Christmas feast last night (Christmas Eve), as this was the only time the whole family was free. I went for a rather traditional menu, including some old favourites. 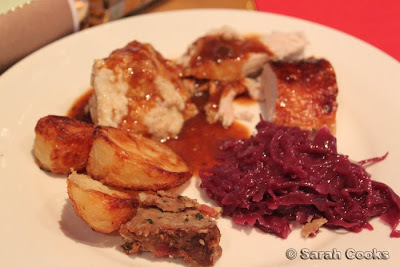 You'll see, unlike previous years, I've finally managed to say no to bread sauce - no-one (including me!) actually eats it. I was fortunate enough to have Christmas Eve off from work, so I was able to take my time making the dinner, and didn't have to rush or panic. In Nigella Christmas, Nigella has a military-operation style timetable to help you get a massive Christmas lunch on the table by 2pm. Compared to my menu, it includes more sides, 2 puddings and a separate vegetarian offering. Ahem! Uh, no thanks. I started off at approximately 2pm by making the onion gravy, from Nigel Slater's Kitchen Diaries. 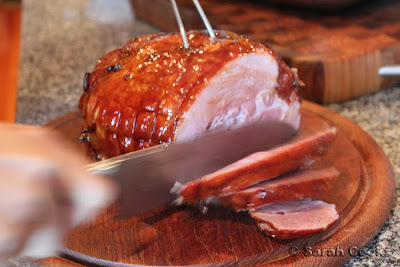 (He serves it with roast pork). Ordinarily I try and do a traditional turkey gravy (i.e. making a stock from the giblets, then adding the juices from the pan), but I didn't have much success with it last year. Plus I had no giblets. 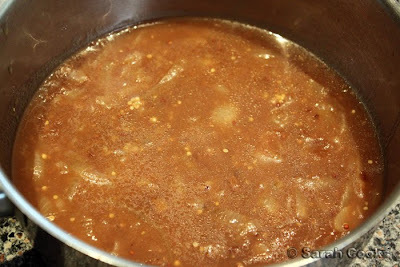 The flavour comes from slowly cooking sliced onions for a good half hour, then adding flour, marsala, stock and mustard. 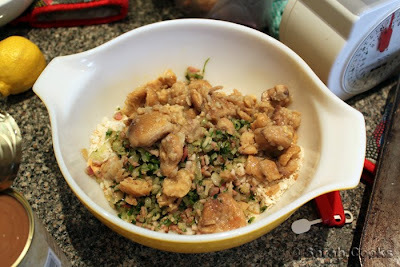 Once it was cooked, I whizzed it up in a blender and set it aside. 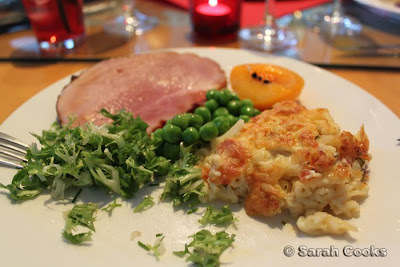 I then had a short break with some Stilton rarebit and Nigella's Christmas Kitchen on Lifestyle Food. 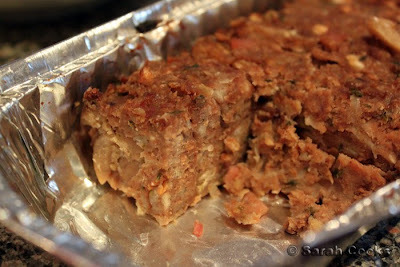 Then, the stuffing. 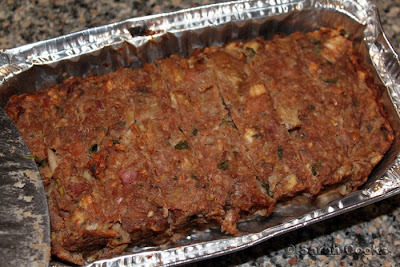 I have made Lidgate's Chestnut Stuffing a few times before, and enjoyed it, but there always just seems to be too much, and it is difficult to dig it out from within the turkey and share it. Thus it always goes to waste. And at $11 for a tin of chestnuts, (you need whole and pureed chestnuts for this recipe), I do not want to waste this stuffing! This year, I decided to halve the quantities, and bake the mixture in 2 mini foil loaf tins rather than stuffing the turkey. I baked one alongside the turkey, and placed the other loaf in the freezer, possibly to accompany a future roast chicken. I now have half a tin of both chestnuts and chestnut puree in the fridge, and will probably make soup out of them. We put the turkey in the oven at about 4:20pm. No brining, no stuffing. 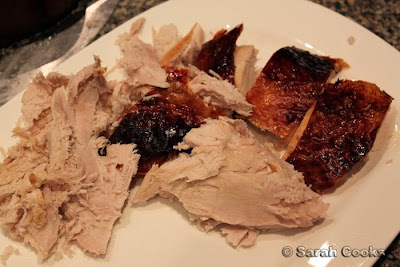 (I tried Nigella's brining method last year and the turkey still turned out dry!) We just put a lot of softened butter under the skin on the breast, and brushed it with a mixture of maple syrup and goosefat. 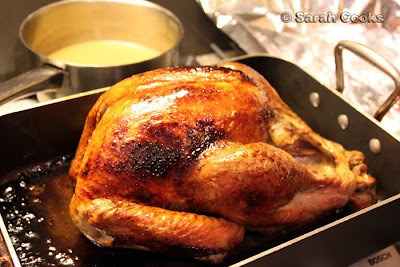 At 200C, the 3kg bird took one and a half hours. Throughout the cooking time, I basted it frequently with German beer. Next, we put the red cabbage on the stove (from a jar), parboiled the potatoes, and made the dough for the bread dumplings. These are absolutely essential for a German Christmas. 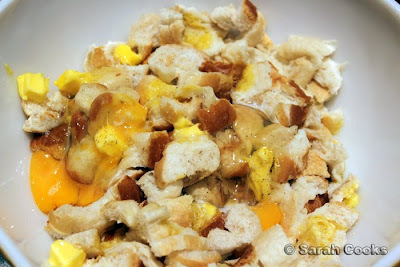 You chop up some white bread rolls, add salt, pepper and cubes of butter, a couple of eggs and some hot milk. The next step is to squish the whole lot together with your hands (not the most pleasant experience), and form them into giant balls. They need 20 minutes cooking in boiling water. This must be done at the last minute, so we had to wait until the turkey was out of the oven before cooking them. I must admit, I felt a huge rush of pride when I pulled the turkey out of the oven. 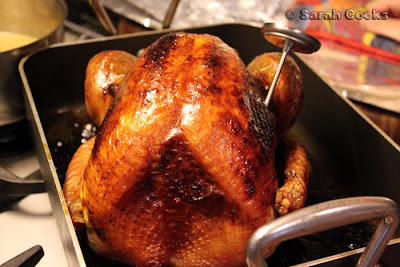 Look how crispy the skin is, how plump and festive it looks! Cooking poultry can sometimes be touch-and-go for me, so I was glad this one turned out so pretty. I think it's my best turkey yet. 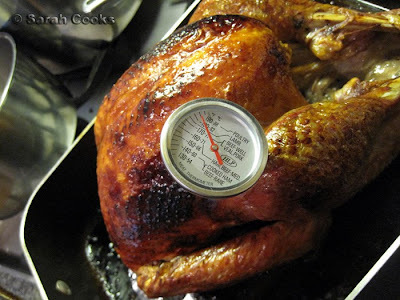 The turkey got up to 80C, so it was done, if a little overdone. 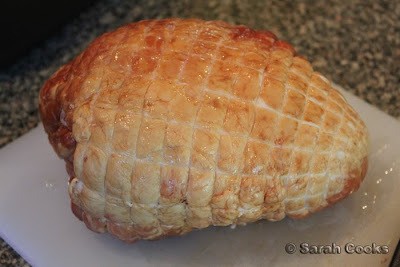 I later did some extra research and realised that "the thickest part" of a turkey is actually in the thigh somewhere. Oh well, either way, it was cooked! I wrapped up the turkey and the tray of stuffing in foil, and cranked up the oven for the roast potatoes. 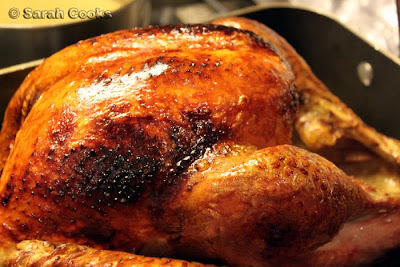 The pan juices for the turkey were wonderful - sticky and oily and delicious, but not at all burnt. I scraped them up and added them to the gravy for more goodness. While the potatoes were roasting, we set the table, boiled the dumplings and reheated the cabbage and gravy. And Christmas Eve dinner was served! Ok, so I am a terrible carver, but still managed to get some good pieces. 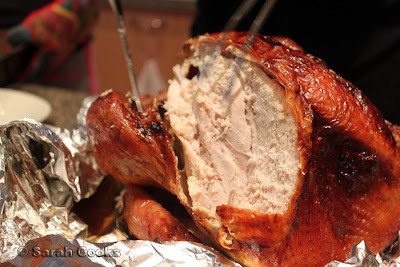 My culinary goal for next year is to learn how to carve a turkey properly, like an American dinner-party hostess! Check out the delicious chunks of chestnut! Bread dumplings - lots of dough to soak up all the gravy. 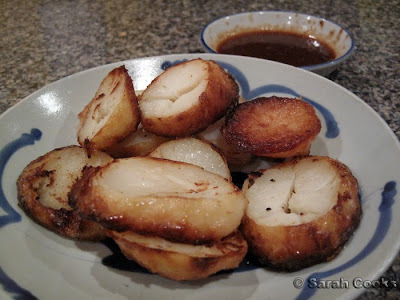 Roast potatoes - I made too many so that I can have leftovers. 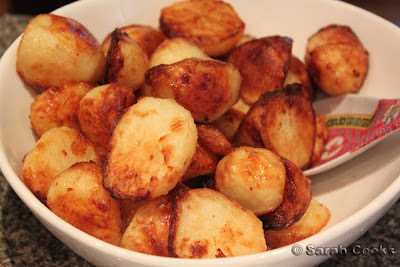 Cold roast potatoes are divine. 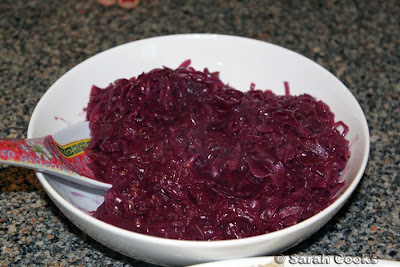 Rotkohl - again, essential with Christmas dinner. One plate! Looks small, I know, but fear not, I certainly went back for seconds. Now, dessert. 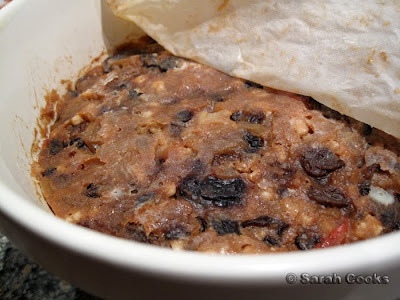 I started steaming my Christmas pudding just before we sat down to eat. They do take 2.5 hours, which gave us time to eat, to recover, and to open presents! 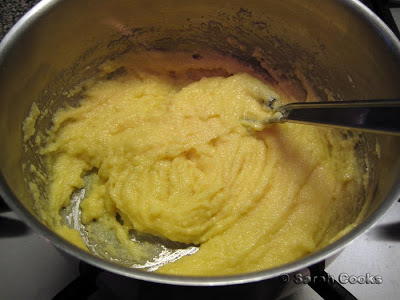 (I also made custard after the presents). 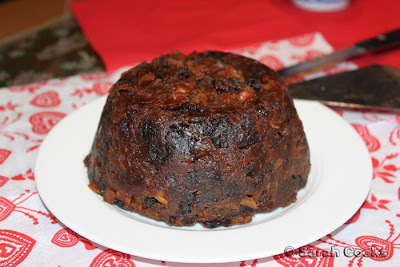 You may remember I made 2 puddings last year, serving one up at Christmas dinner, and keeping the other in the fridge for this year. (The Roux brothers say you can keep them up to 5 years, and that older ones are "indescribably glorious"). I was a little nervous about a year-old pudding, but when I took it out of the fridge, it looked and smelled ok! Year-old pudding - still looks ok! I wrapped it in 2 layers of foil and steamed it, and at the end it looked like this..
And then tipped it out, and it came out (pretty much) in one piece. 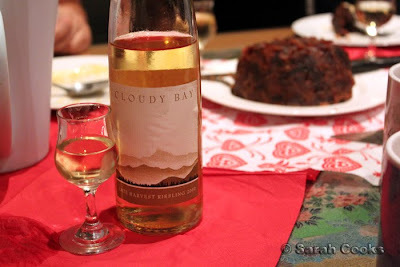 I managed to wodge the little stuck bits back in place and it still looked ok.
We ate it with custard and some Cloudy Bay 2008 late harvest Riesling (a gift we bought for my dad!). Despite my reservations, my family seemed to love the pudding. 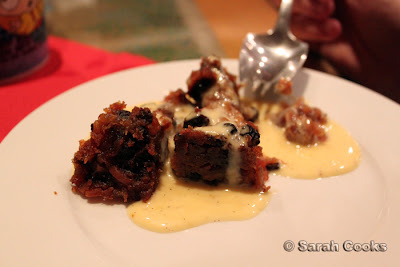 I really liked the fact that it was a lot mellower than last year's pudding, more cakey and less boozy. I am now intrigued to compare puddings across the years. Perhaps a future project! 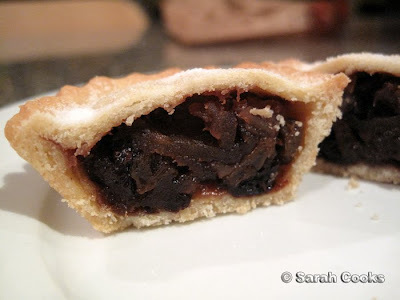 Oh mince pie, how I love thee. I have made them quite a few times - Nigella's standard star-topped, her frangipane mince pies (both in mini and Bakewellian size), but this year I wanted something altogether more traditional. Something that tastes how you would imagine the picture on the Mr Kipling's boxes to taste. Now, the ones I like the best have more of a buttery pastry than Nigella's (she uses a plain shortcrust), but for some reason I didn't think a pâte sablée would be quite right. 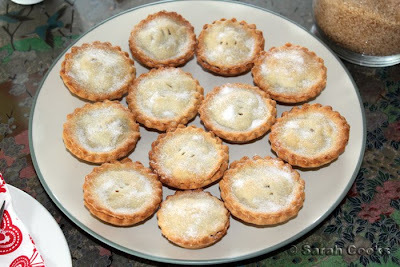 The answer came in the Christmas issue of Delicious, with Rick Stein's mum's mince pie recipe. He describes them as having "the crispiest, richest shortcrust pastry". Sold! 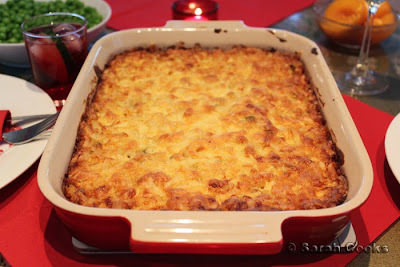 The mince itself was made a couple of weeks in advance. 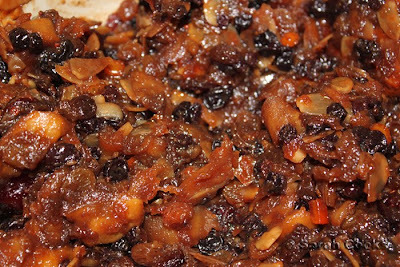 I chose "Hettie Potter's suet free mincemeat" from How to be a Domestic Goddess. 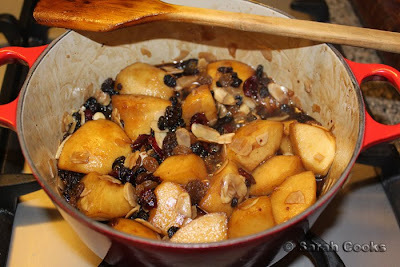 It contains, unsurprisingly, no suet, but many, many big chunks of apples, as well as dried and glacé fruits, almonds and brandy. 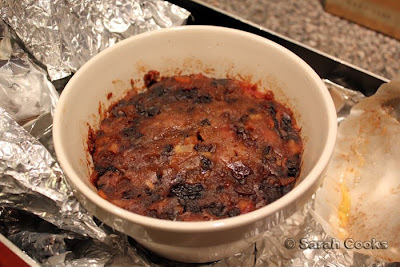 It needs to be cooked on a low heat until it looks and smells, well, like fruit mince! 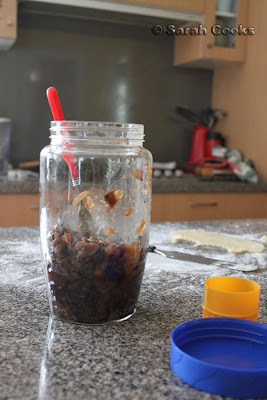 I stored it in a dishwasher-sterilized jar for a couple of weeks, before making the mince pies themselves. We were having some olde English family friends over for arvo tea and I wanted to surprise them with my baked goods. Rick Stein's pastry was, indeed, very buttery, and a little difficult to handle. I'm glad I employed the Nigella trick of flash-freezing the flour and cubed butter first! 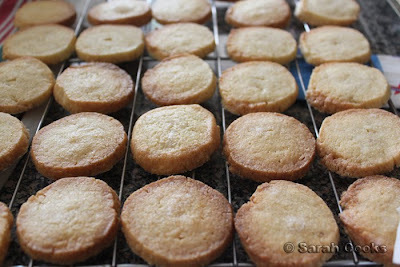 I used a crimped cookie cutter to cut out the pastry to get the crispy edges, and sprinkled the tops with castor sugar. 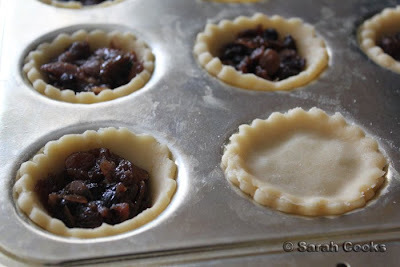 There was enough pastry and mince to make 24, but I only made 12 - there is only so much seasonal excess one can take. (I speak as one just recovering from the seasonal mix of overindulgence and overwork). 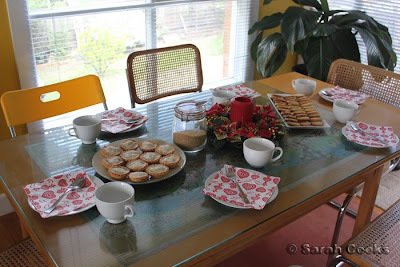 In addition to the mince pies, I served petits sablés and Christmas Cake. And tea, of course! I love the way they look like little coins! 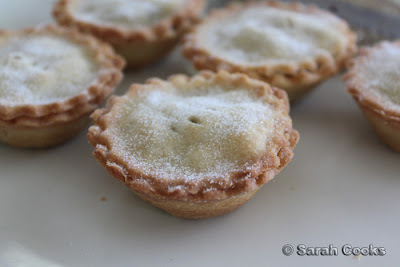 The mince pies were easy to make, the pastry was buttery, short and crumbly. The olde English friends approved. Success! There are times when even I need something gentle on the stomach. Virus, flu, whatever, it's not pleasant and it's zapped my appetite. I thought I had an iron stomach, people!!! 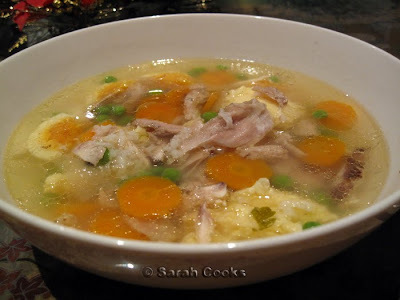 Last night my body decided it needed chicken soup. No MSG, no powdered stock, just rich chicken broth. Preferably with some soft rice and German dumplings for ease-of-chewing. We had a couple of chicken carcasses in the freezer, so put them in a big pot with a halved onion, a chilli, some carrots, peppercorns, bay leaves, salt and parsley stalks. These ingredients were then covered with water, brought to the boil, and left to simmer for a good few hours. I can't tell you how good the kitchen smelled. In the meantime, I collapsed on the couch in front of a Boston Legal marathon. 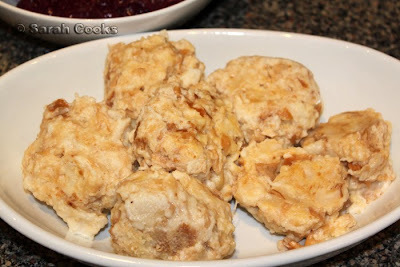 I found a recipe for Griessklöβchen (aka semolina or farina dumplings) from my no-nonsense German Cookery book. There were quite a few recipes for Suppeneinlagen (soup garnishes) in there, but the Griessklöβchen were the easiest and I already had all the ingredients. (Full recipe below). I also added some peas, and a hardboiled egg to the soup, and consumed it, perfectly contented, in front of more sweet sweet Boston Legal. Bring the milk, butter and seasoning to a boil. Sprinkle in farina and form into a lump. Remove from heat and, singly, mix in eggs. Cool. 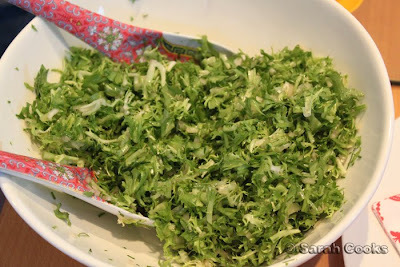 Cut into small dumplings. 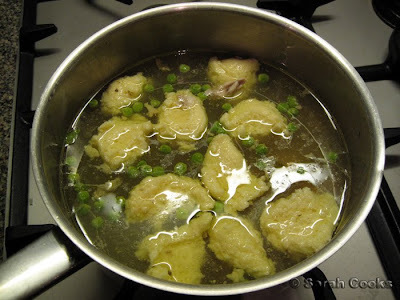 Place in boiling soup stock until dumplings rise to the surface. The German Cookery book comes from "The Crown Classic Cookbook Series" - "the dishes your mother used to make, from the cookbook your grandmother brought over from the old country". I really love this series of books - I also have the Czech version, and am on the lookout for the Finnish, Polish and Jewish versions! These soup dumplings reminded me of a dish that Oma Freida in Germany makes, which I tried on my trip to Germany in 07/08: Griessklöβchen mit Sauerkirschen. AKA semolina dumplings with sour cherries. And I just had to go searching through my old holiday pics to share this with you. I really liked the old blue bowl it was served in. 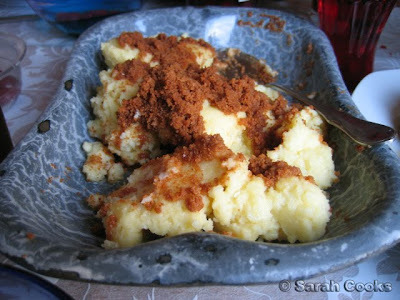 Basically I think it is a similar dumpling dough, scooped into a bowl and topped with fried breadcrumbs. It is served with sour cherries from a jar. We had it for lunch one wintry January day, and I don't think you can get more homestyle German cookery than that. This will be a quick post, as I am not feeling well with the flu and general unpleasantness. Not sure if it's too much rich food or too much hard work?? I like to think it's the latter. 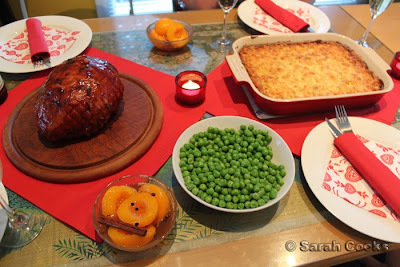 Anyway, the photos can do the talking, as this is pretty much a repeat of last year's wildly successful Ham Dinner. 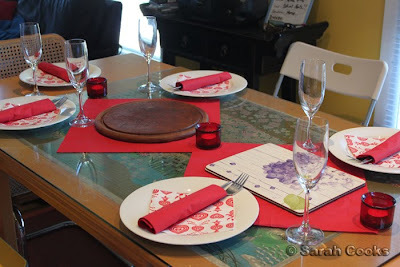 As you can see, we are making very good use of our red Ikea paper napkins, and some new red tea-light holders! 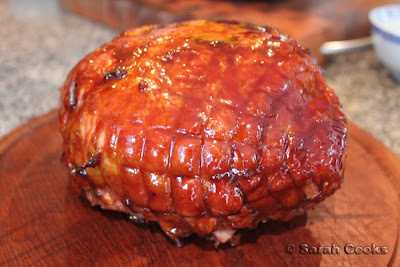 Here is the cold ham - it was a free-range ham bought from the wonderful Rendinas butchery. I sliced off some of the fat, and glazed it with a mixture of dark muscovado sugar, treacle and hot English mustard, before cooking it in a hot oven. One accompaniment was an endive salad, chosen to provide a bitter contrast to the salty ham and rich mac & cheese. And here is the mac & cheese, Tyler Florence's recipe. 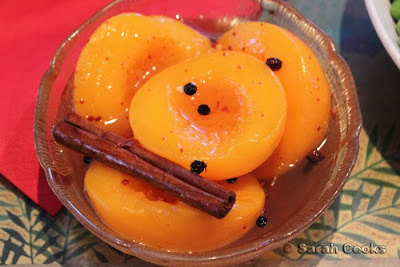 And Nigella's delicious spiced peaches (Nigella Express). 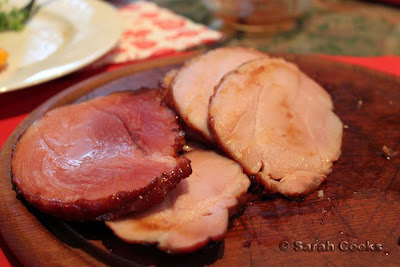 At first I sliced the ham quite thickly, but it turns out that thinner slices are nicer! 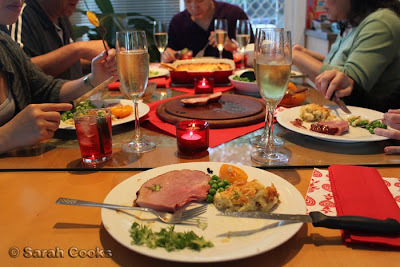 A delicious meal overall, although I must say I'm a bit disillusioned with the quality of ham in Australia. I guess I've been spoiled with brilliant ham in London and Germany?